I can't help thinking of Spring these days. February's definitely the longest month of the year in my book. I'm so ready to be outside and to feel the sun!! 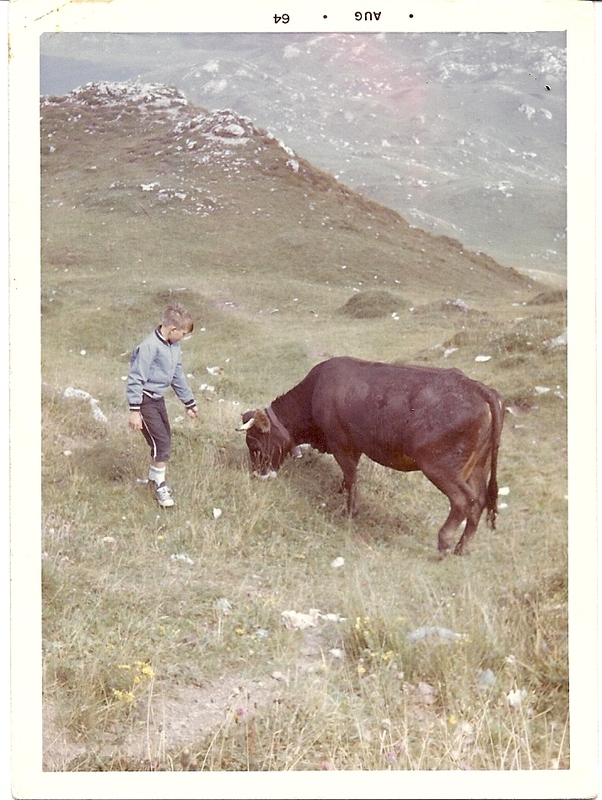 And to pick flowers, be barefoot and sing in the mountains and feed goats and really big bulls!! hahaha ok I'm totally functioning on too little sleep, but really I neeed some nice weather right about now. And that's all the complaining I'm going to do about Winter. Promise. ps- I'm a pretty good yodeler. Really. I love the old photograph of your Dad! It would make a beautiful pastoral painting! I'm sick of Winter also. I have 4ft of snow sitting on my patio. I'll probably be looking at it till June! Both of your photos are so sweet! I have a pile of golden books I can't bear to get rid of and my daughter is 12! I love all the illustrations! You're not the only one tired of winter, the older I get the more I get why retired people move to FL and AZ! Just last night as I was looking out our backyard at all the snow and ice and was thinking gosh, I'd do anything to fast forward a few months to laying on our patio catching some rays!! Me too, me too. Bring.It.On. Lauren- What a beautiful photograph of your father in Italy! You have every right to complain about winter! This one has lasted forever! Love the Heidi pictures! Okay, I'm depressed...I was born in '64, so technically, I could be your mother (although I look too young ! hahahaha again and again.) I loved the Heidi movie when I was a kid. Simpler times. I am totally over winter. More snow tomorrow here, I don't care that it's only 2 inches more, it still adds to the 4 feet. I hear you! What a great photo of your dad! Those are just priceless...the cold weather really bums me out, too! I'm ready for some beautiful spring time!!! When we had rain, day after day, in December I was surprised at how blue it made me. I'm with you, this far into winter I'm over 'it' and ready to be in the garden planting fresh herbs and flowers. first of all i love your blog!! oh and your layout is amazing. did you design it yourself? 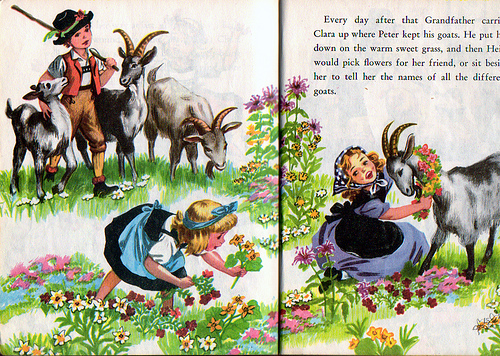 the photo of the vintage story book is lovely - they are such sweet classics. keep up the amazing work. i will def be visiting consistently! please check out my new blog :) & follow if you'd like. i like your blog, all collection are really awesome.i like a "Dream home at la dolce Vita". i am interested in home design..